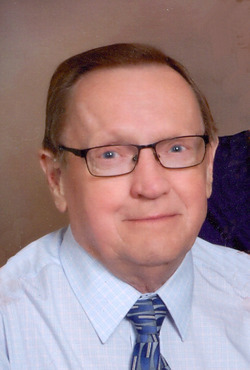 Ronald D. Hegg, retired Central Receiving employee, Grand Forks, passed away peacefully at home on Thursday, March 15, 2018. He was 80. Ron was born on July 6, 1937 in Grand Forks to Norris and Edna (Sannes) Hegg. He was raised on a farm near Reynolds, ND and attended a country school. In 1954, he met Darlyne Miller and on October 7, 1956, they were united in marriage at St. Matthew’s Lutheran Church in Thompson. Most of his employment was in the Central Receiving Department at the University of North Dakota, where he worked for more than 40 years. Ron enjoyed fishing, woodworking and spending time with his family. He is survived by his wife of 62 years, Darlyne; daughter, Rhonda (Brian) Sand, Grand Forks; son, Jeff (Stella) Hegg, White Bear Lake, MN; 4 grandchildren, Justin Hegg, Melissa (Trevor) Lennon, Sarah Sand, and Courtney Hegg; great granddaughter, Olivia Lennon; brothers, Neil (Judy) Hegg, Thompson, ND and Earl Hegg, Grand Forks; and many nieces and nephews. Ron was preceded in death by his parents, a son, Richard Ronald Hegg, and sister-in-law, Shirley Hegg. Funeral Services will be held at 11 a.m. Tuesday, March 20, at Immanuel Lutheran Church of Grand Forks. Visitation will be on Monday from 5 to 7 p.m. with a 7p.m. prayer service at Amundson Funeral Home. Visitation will also be held one hour prior to the service. Burial will be in Memorial Park South Cemetery of Grand Forks. In lieu of flowers, memorials can be directed to Immanuel Lutheran Church.